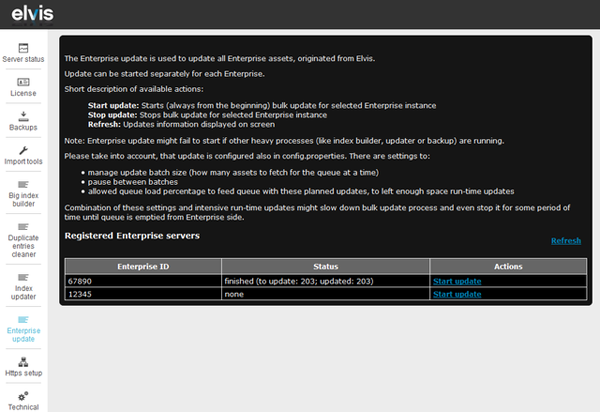 The Enterprise update admin page is used to update all Enterprise objects which are linked to Elvis. Since Elvis 4.6, asset updates in Elvis are immediately synchronized with Enterprise shadow objects (performed by the scheduled synchronization job, see also Elvis Content Source). To synchronize data which might be out of sync after upgrading to 4.6.x or in case the synchronization job was switched off / not working, it is possible to run this bulk update. The admin page shows registered Enterprise server IDs (one or several, depending to your system configuration). Note: Enterprise servers are only shown when the synchronization job is active. A full update can be started per Enterprise server. Started updates can be stopped if required. Use "Refresh" to update the status of the page, it will show a list of registered Enterprise servers and status of their update, if update was started. Note: Enterprise update might fail to start if other heavy processes (like index builder, updater or backup) are running. There are a few settings to tune the update process, these can be configured in <Elvis Config>/config.properties (server restart required).